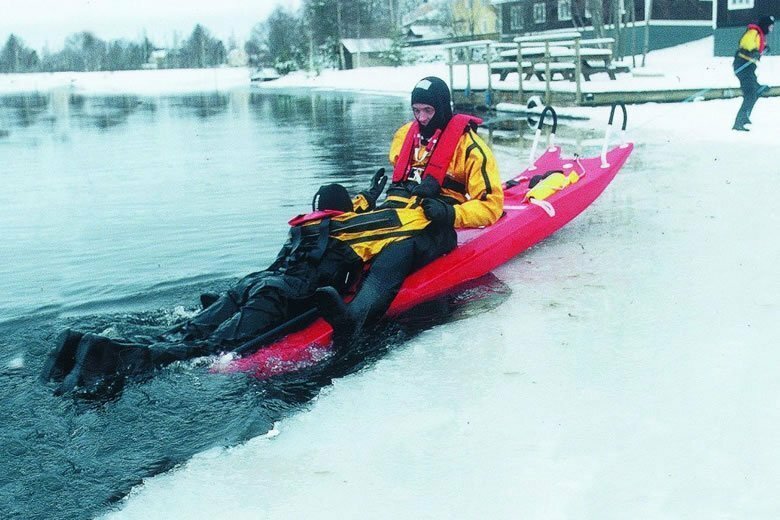 Ice rescue techniques with Mayday-Hansa-Board- For professional water and Ice rescue. When Urban Kraft, a keen Swedish windsurfer, was practising for a windsurf competition on an ice-covered sea, he could have never imagined the outcome. He noticed that as the ice was breaking his floating board had the potential to be used as an ice and water rescue platform. He worked closely with the Swedish lifesaving association, professional’s rescuers and developed a stable rescue board that could be used to transport both the victim and rescuer at the same time. His idea became the Mayday-Hansa-Board, an essential piece of lifesaving equipment used by professional rescue teams around the world. 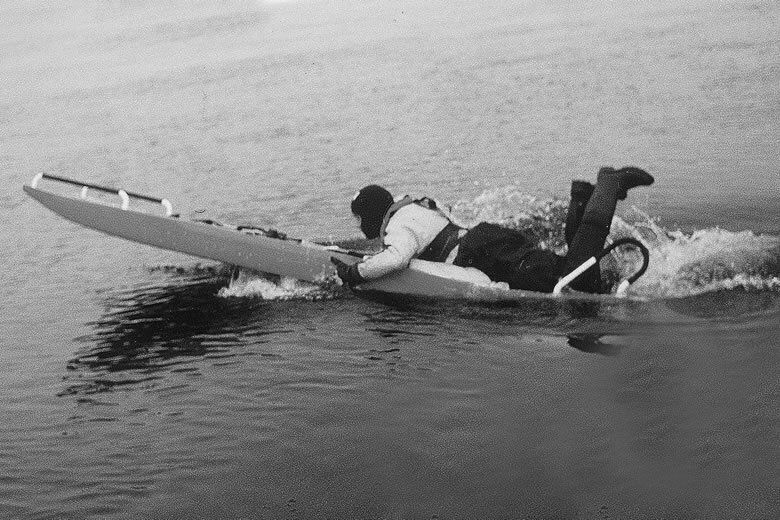 Stockholm Fire Captain Alf Alexanderson was one of the first persons to test the Mayday-Hansa-Board, which is manufactured by Mayday Scandinavian International AB in Sweden. Having tested this piece of equipment in the field for over 15 years, he knows that it could improve water and ice rescues everywhere. Captain Alexanderson highlights “It is important that the rescuer feels safe when operating in a rescue situation on the ice and open water”. A 300-metre line which shores the board. In addition, there is a peep-hole in the board so that the rescuer can search for victims under the water. The board has a maximum buoyancy is 300 kg. Several hand straps are attached, so when responding to an emergency with multiple victims a greater number of people can safely hold on to the board. For an injured person there is a safety belt to secure the victim. A waterproof accessory bag contains a thermal blanket, ice picks and a light stick. (The ice picks enable the rescuer to move the board forward over the ice). There are four carrying handles and additional high handles that enable the rescuer to push or run with the board across the ice. An extra 23-metre safety throwing line is available for swift water rescue or where there are more than one endangered persons. A rescue hook for checking if the ice is secure to walk on and to grab things. A paddle is for travelling a longer distance in open water. While running an ice-rescue training module for Stockholm Fire department´s rescue personnel, Alexandersson tested all the equipment designed for rescue operations. “The Mayday-Hansa-Board came out best in every situation Alexandersson says, some very difficult and dangerous operations made us focus on how a rescue could be performed better and safer, the Mayday-Hansa-Board was the best answer”. When a rescuer wears a dry suit the rescuer is enabled to reach a person in most water and ice conditions. Alexanderson says “I have never experienced a tool that works as well in different types of scenarios as the Mayday-Hansa-Board, and I say that based on my own experiences”. As well as being carried on rescue vehicles, applications for the board include being carried by helicopter and as a compliment aboard boats. The board can be used as a sleigh or a stretcher and has been used by divers and fire-fighters as a sledge to transport equipment. The Mayday-Hansa-Board has been in use for over 15 years on the global market. In Sweden, every fire department is equipped with at least one Mayday-Hansa-Board, and the first responder vehicle to a rescue operation is equipped with the board as standard. The board is carried on the roof sometimes in a specially made aluminium box; on custom made vehicles the board housing is included in the concept design. Fire captain Alexandersson focuses on the following key points when training with the board. Where possible there should be at least two rescuers in dry suits, one on the board and one on the line, to secure return. The rescue team leader makes a quick observation and after that, he signals for the board to move forward towards the person in need. To get the victim up on the board, the rescuer moves forward and with the help of his own bodyweight moves the board under the victim, then holding the victim the rescuer pulls the victim on the board whilst moving backwards. During the rescue the team leader assesses the situation and makes preparation to include; calling for back-up, planning the return journey, arranging for medical care or a rescue boat.” If there are multiple persons at risk then more boards are called in. In different rescue situations, the rescuer should always attempt to move the board in a quick and safe manner whilst maintaining communication with the line person. The same should be repeated on the return journey whilst providing necessary first-aid assistance to the victim. 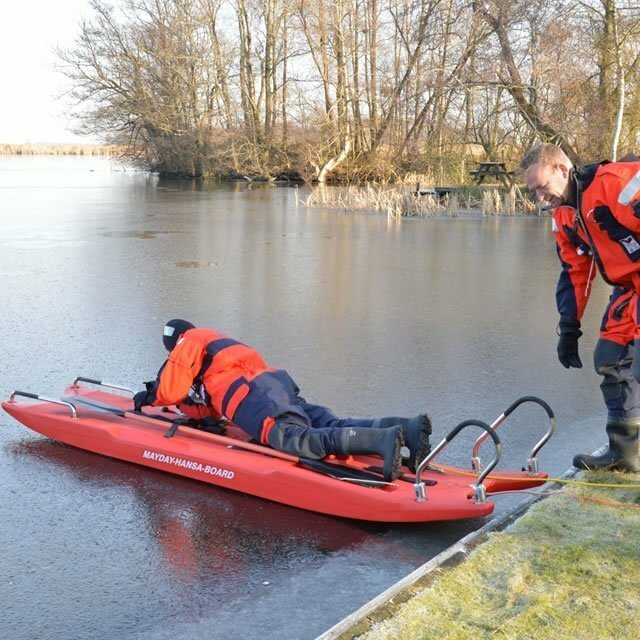 In preparedness of an incident, it is essential that the first response vehicle should always include a Mayday–Hansa–Board and two dry suits to enable a fast and safe response to any water or ice emergency. Training is also given in providing assistance to fire and ambulance services where the board is used to transport equipment over water, ice or mud. As well as people the Mayday-Hansa-Board is used to save animals. Rescue Captain Alf Alexandersson says, “With the Mayday-Hansa-Board as life insurance, I can focus on the rescue operation without anxiety for my own security. I can be confident that when there is a dangerous situation I am able to perform a good and professional rescue operation”.